For many adults in the workplace today, dreams of finally having a perfectly straight smile can feel just a little too far out of reach. After all, you’ve worked hard to establish a polished, professional image among your peers; the last thing you want is to ruin it by having to wear clunky metal braces. You deserve a solution that helps you feel secure and comfortable in your everyday life, not one that transports you back to junior high. That’s why we’re happy to offer Invisalign as a cosmetic treatment here at Complete Cosmetic Care Dentistry in Sapulpa, OK. With the help of Invisalign, you can transform your teeth in a virtually invisible fashion, leaving you with a smile that you’ll be proud to show off to the world. Invisalign treatment consists of a set of clear aligners, each designed to represent a stage of movement as your teeth move into their ideal alignment. Drs. Mohanna and Georgy will ensure that these appliances are custom-fit with the help of three-dimensional computer modeling. 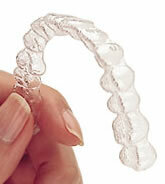 Then, all you need to do is wear each set of aligners for around two weeks before moving onto the next. No need for uncomfortable tightening sessions or constant adjustments – when using Invisalign aligners, you’ll only need to come to our Sapulpa office every six to eight weeks so that we keep an eye on your progress. They’re virtually unnoticeable, allowing you to achieve a transformed smile without sacrificing your self-confidence in the process. Traditional metal braces often cause mouth sores or cuts; with Invisalign, you won’t have to worry about discomfort. The aligners are removable, meaning that you won’t need to make any disruptive changes to your diet or oral hygiene routine. Invisalign treatment is usually completed in around a year – a significantly shorter time than traditional metal braces, which can take multiple years. Don’t let crooked teeth keep you from enjoying yourself. Let Dr. Mohanna and Dr. Georgy give you something to smile about with the help of Invisalign. Our team is committed to providing you with effective, personalized care that always puts your comfort first. Call our Sapulpa office today with any questions you might have about Invisalign, or if you’d like to schedule a consultation.